Buffalo Chickpea Lettuce Wraps! You are going to love these vegan and gluten-free wraps, ready in less than 20 minutes! I’m a sucker for lettuce wraps. Light, crunchy, and piled high with ALL the toppings, why don’t I eat these more often!? I have no problem admitting that one of my favorite take-out meals of all time is P.F. Changs tofu lettuce wraps. How are they so unbelievably good? I easily throw out my we-are-not-eating-at-chain-restaurants rule when it comes to those wraps. And while I’ve made them at home a few times, I wanted something a little simpler for my current state of life this month —> living alone; teeny-tiny rented kitchen space. Besides being packed with texture, these lettuce wraps are so simple. Ready in less than 20 minutes, start to finish. 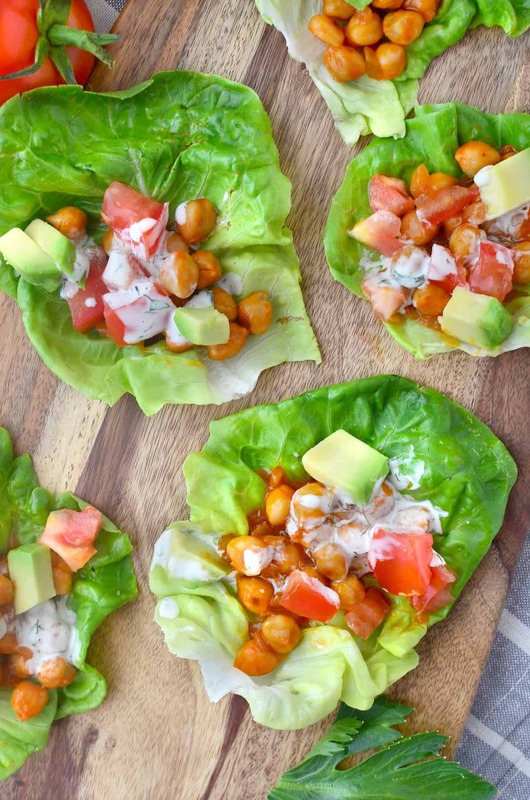 If you’re really feeling hangry motivated you can chop up the ingredients as you cook the chickpeas giving you lettuce wrap glory in less than 15 minutes. Because when you’re starving, every minute counts. For lettuce options, I like to stick with Boston or Butter because they’re easy to fold and wrap, but really any kind works. If you like a little more crunch with your wrap, I would recommend iceberg or romaine. Nutritionally speaking, these wraps are superstars. Packed with protein (buffalo chickpeas ♥), healthy fats (the beautiful avocado) and lots of vegetables (cucumbers, tomatoes, um, lettuce). If you’re looking for a lighter dinner alternative, this is it. You are going to love these! In a medium skillet pan, cook the onion in 1 tsp. olive oil over medium-high heat until soft and translucent, about 5 minutes. Add the chickpeas and cook until toasted, another 2-3 minutes. Stir in the buffalo sauce and reduce heat to low. Simmer while you make the dressing. Turn off heat and let cool slightly. Toss together the mayo, soymilk, parsley, dill, garlic powder, and pinch salt/pepper. Season to taste. Assemble the wraps! 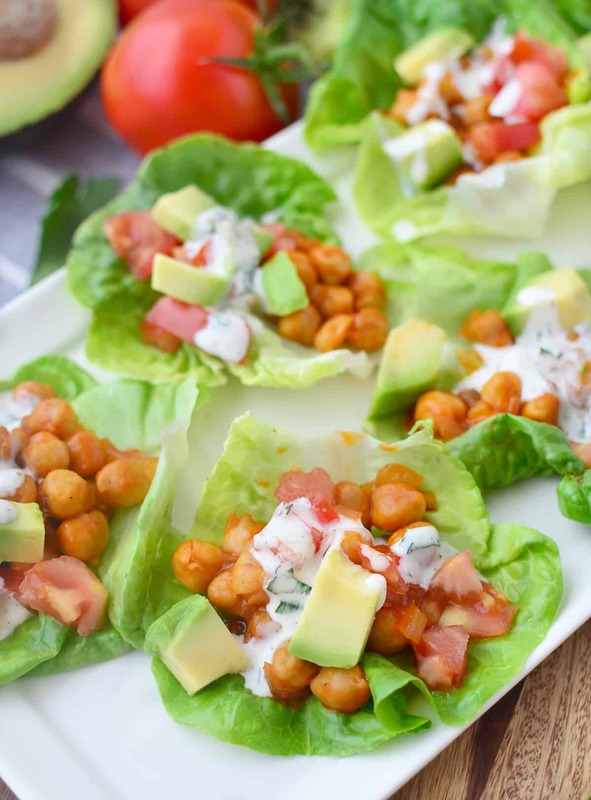 Place a heaping tablespoon or two of the chickpeas on each piece of lettuce. Top with avocados, tomatoes and cucumber. Drizzle with ranch dressing. I’m a sucker for lettuce wraps too! This is such a great idea and love how you made it healthy with the chickpeas! Gorgeous! Ahh I have been in love with chickpeas lately! I stil have a bunch I need to put to good use. Buffalo flavor sounds so delish! What a cute idea!! And who doesn’t love buffalo chicken?! Perfect! What a unique lettuce wrap idea! 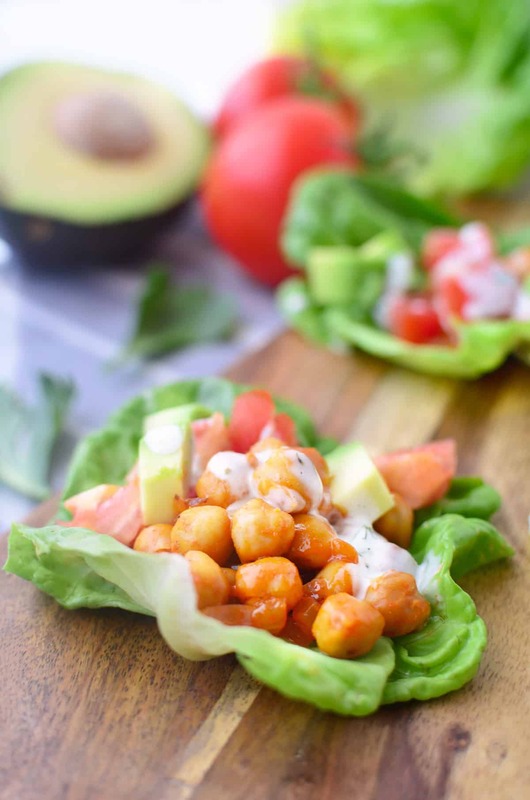 Never thought of making buffalo chickpeas – they must pair perfectly with the creamy avocado and ranch dressing. Been loving lettuce wraps recently too – as we have romaine lettuce growing like crazy in our garden! I love the homemade ranch! What buffalo sauce do you use? 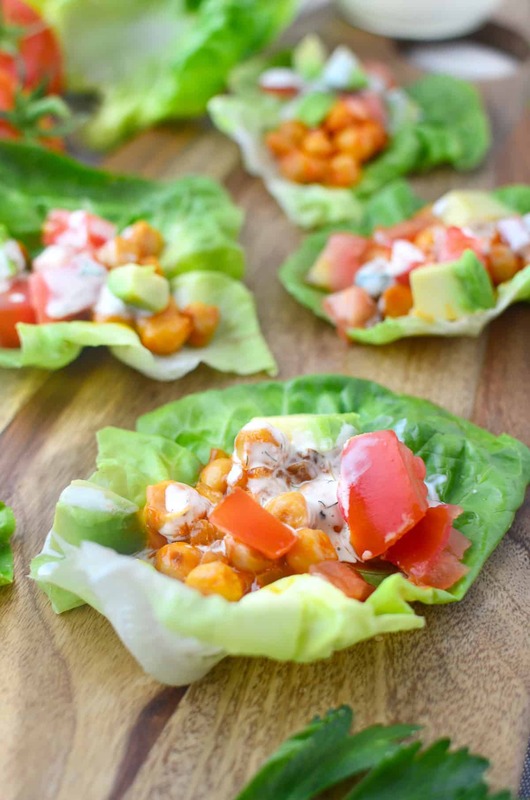 Love this fun buffalo twist with the chickpeas! I love green wraps! They’re so crisp, crunchy, and just perfect for the summer. I actually have a tupperware full of chickpeas in the fridge… maybe this should be my plan for lunch tomorrow! Ah – I love this dish! I love chickpeas, Buffalo sauce, and avocado, so…… Yes! A winner! I’m a huge fan of buffalo sauce and this is a fantastic vegetarian twist on the classic chicken version. Definitely will be featuring these in one of my weekly line-ups soon! LOVE all things buffalo! Just found your blog, and love it as well! It’s always great to find other RD bloggers out there. Buffalo sauce is one of my favorite things ever. I’ll even dip french fries in it! I’m so happy to have found a recipe that uses buffalo sauce that doesn’t include chicken because I’m trying to cut chicken out of my diet! Great recipe, Alex! These are amazing! Such a great recipe, perfect for weeknights.